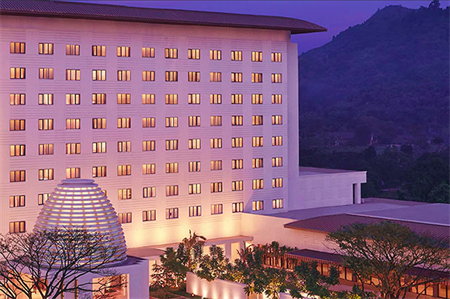 Taj Hotels Resorts & Palaces has opened the Vivanta by Taj - Guwahati, Assam hotel in north-east India. The 150-room hotel is situated in the Assam region and is spread over five acres of courtyard gardens, designed to reflect the forests in the local area. The main pavilion building takes its design from the famed Kamakhya temple in Guwahati. The hotel has a range of meetings and events facilties, including one of the largest banqueting spaces in north-east India. There is more than 7620sqm of flexible meeting space, including a pillarless ballroom of 1829sqm in size. Dining facilities include the hotel’s signature oriental restaurant Umami, which serves Japanese and Chinese cuisine, and all-day-dining restaurant Seven. There is also a tea lounge and bar onsite. Other facilities include a spa, salon, fitness centre and a large outdoor pool.